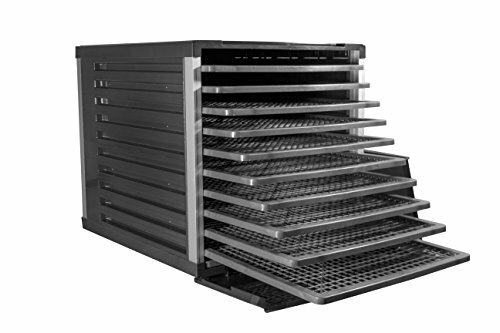 LEM Products (#1153) 10-Tray Food Dehydrator is an 800-watt unit offering you 15 square feet of drying space. Thermostat adjusts from 95 degrees F to 155 degrees F (35 degrees C to 68 degrees C). The removable shelves and drip tray allow for a no hassle clean-up every time. Its clear, heat-trapping door provides you with visibility during use, as well as, faster drying time. The digital timer has an automatic shut-off feature for your convenience and the 15” x 15” square trays allow for four-way rotation. It has a maximum dry time of 30 hours and 55 minutes. The cord is 60 inches long. Dimensions: 19-20/41” x 16-15/28” x 16-13/14”. Weight: 15.43 pounds. Food grade plastic housing with rigid aluminum reinforced corners for extended life. Two-year warranty. Make your own organic, all-natural snacks. LEM Products provides a selection of food dehydrators that make food drying fun, fast and easy. Drying is a year-round and creative way to preserve fruits, vegetables, herbs, seeds, fish and meats. Food dehydrators eliminate safety concerns of drying foods in alternate ways. Fruits can be dried into chips or fruit leathers. Vegetables can be dried to make dry soup mixes, or even veggie leathers. Meats and fish can be dried into jerky. Use a food dryer for re-crisping breads and crackers. There are many advantages to drying and preserving your own food: Save money, make your own fruit or vegetable mixtures, control sugar content and eliminate additives found in most store-bought items. Dehydrating can be an alternative to canning and freezing, but also compliments these preservation methods. Snacks and treats for your pets are fun and easy to make. For the creative & crafty, food dehydrators are useful for: cake decorations, drying flowers (potpourri), dough art and even drying photographs. Choose the LEM Products Food Dehydrator that’s perfect for you: #1152 (5-Tray with Digital Timer); #1153 (10-Tray with Digital Timer); #1154 (Digital, Professional, Stainless Steel, 10-Tray) or #778A (Stainless Steel, 10-Tray with Timer). If you have any questions about this product by LEM, contact us by completing and submitting the form below. If you are looking for a specif part number, please include it with your message.